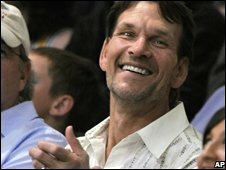 Actor Patrick Swayze has said that undergoing chemotherapy for pancreatic cancer was "hell on wheels". The 56-year-old star told the New York Times that he is still going through a "battle zone", despite a return to acting following intensive treatment. "I'm proud of what I'm doing," added Swayze, who is playing the lead in US TV police drama The Beast. The Dirty Dancing star was diagnosed with the disease in March, and has also undergone experimental therapy. "I do find myself, at the end of the day, riding home, sort of catching myself with a smile on my face," Swayze told the newspaper. "I'm still fine to work, I haven't changed - oh, I have changed, what am I saying? It's a battle zone I go through. "Chemo, no matter how you cut it, is hell on wheels." He added: "How do you nurture a positive attitude when all the statistics say you're a dead man? You go to work." Pancreatic cancer is one of the most virulent forms of cancer which medicals experts say has a 5% five-year survival rate. Swayze's treatment programme has allowed him to work 12-hour days filming the series. The Beast is scheduled to start airing on the Arts and Entertainment (A&E) network in the US early next year.